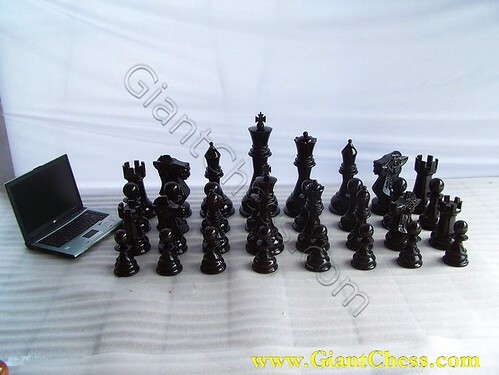 Black and glossy big chess pieces beside laptop looks so elegant and gallant. See its perfect polish and carved. Those are handmade product by professional craftsman that very detail in produce chess set. Those made of Teak wood, which has durable characteristic and can use both indoors and outdoors. Because its quality of main wood that is Teak wood, those chess pieces durable in any seasons. You can use it in your garden, or in your house for chess game. Wood chess pieces is our speciality and we have various kind designs and models of chess pieces. We have standart chess models, staunton chess, decorative chess, custom chess in various colors. The picture show one of our collection. The color is black and glossy. We have another color or you can decided your own chess models and colors. Buy our collection of chess set for your collection, or you want to decorate your house with our big chess pieces.